Are you looking for a sturdy and reliable baby gate? Then you may want to check out the Supergate Ergo Pressure or Hardware Mount Plastic Gate. 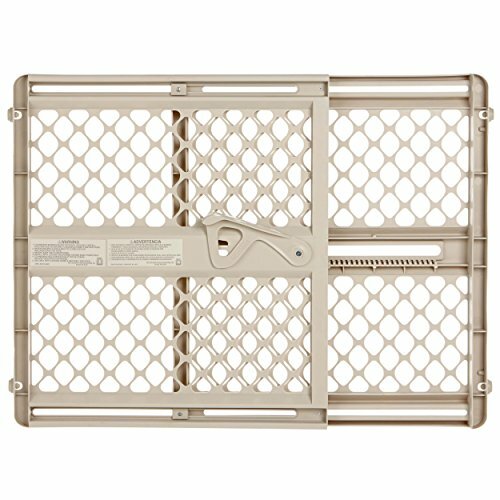 The Supergate Ergo Pressure or Hardware Mount Plastic Gate adjusts to fit openings between 26" to 42" wide, and the gate is 26" high. The handle is made to fit into the palm of your hand, which makes it very easy to operate. This product can be pressure mounted or hardware mounted. This comes with rail sockets, which allow you to mount the gate between two railings or a railing and a wall. The door sockets add extra security. This product is weather-resistant. It is made in the USA. All products by North States are JPMA certified. As of this writing there are 463 customer comments and 32 answered questions for the Supergate Ergo Pressure or Hardware Mount Plastic Gate. I've read through the customer feedback, and then condensed the results into this review. I hope that this helps you when shopping for a baby gate. This gate must be stepped over each time you pass through. If you are short, this could be an issue. The gate is 26 inches high which is lower than most gates that have a door, but it still may be too high for some people. The Supergate Ergo Pressure or Hardware Mount Plastic Gate has the ability to either be a pressure mounted or hardware mounted gate. The pressure mount will require holes in your walls during installation. However, pressure mounting will not be as secure as hardware mounting, which will require drilling into the walls. "This gate was easy to set up, secure, and the right price." "This is a useful gate at an affordable price and the various installation options make it easy to customize to your own needs." "the criss-cross pattern is safer for my small dog than vertical bars would be." The Supergate Ergo Pressure or Hardware Mount Plastic Gate is easy to install and the price is very low. It features a criss cross pattern instead of bars. Some people liked that better since small animals couldn't get stuck in it as easily. This gate can be either pressure mounted or hardware mounted. It is a simple step over gate that doesn't have a swinging door. The height of the gate is 26 inches. If you are wanting an inexpensive gate, this is a real winner in our eyes. For even more information, check out the rest of our baby gate reviews.